Social Media & Reputation Packages Designed for Positive Organic Growth. A Marketing Partner Designed For You. 3 Birds is a nationally recognized solutions, consulting, and analytics provider founded on a simple belief: dealerships and OEMs deserve a better digital marketing partner. For today’s consumers, how a dealership portrays itself online, on social media platforms and review sites, can make the difference between ruling them out or purchasing a vehicle from them. 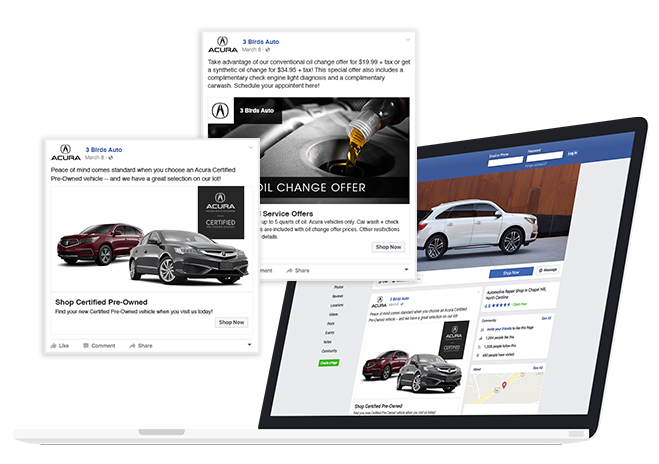 The 3 Birds’ Honda / Acura Social Media & Reputation Packages were designed to help dealerships maintain the positive online presence consumers expect. This starter package provides full access to our intuitive technology platform for social media and reputation management. The Basic Package makes it easy for anyone to manage content posting and monitoring across multiple channels, and offers robust tracking and analytics to guide future marketing messages. Engage your online audiences with access to our exclusive library of thousands of social media content assets. Fresh Honda / Acura content is added weekly to keep your dealership at the forefront of the conversation. Monitor the top 10 online review sites with Neighborhood Watch and manage reputation from within our platform. Plus, use Competitor Watch to track the online reputation of up to five competitive brand dealerships in your DMA to help you maintain a competitive advantage. 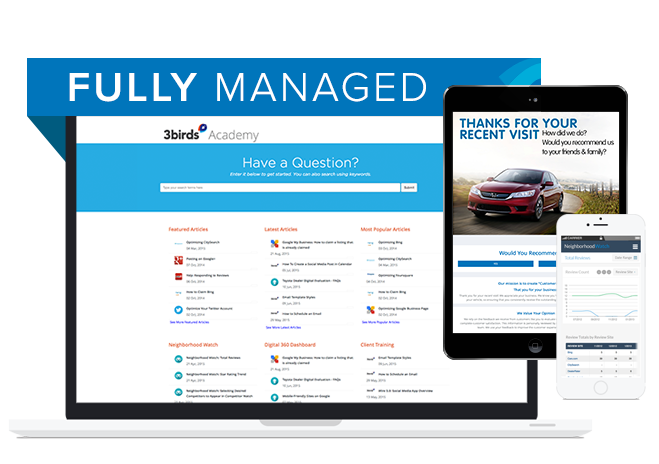 Enjoy full access to 3 Birds Academy, an online portal with training materials and guides to help you make the most of every social channel and review site. Set goals and review performance each month during a monthly coaching call with your dedicated 3 Birds Performance Manager. Automobile dealerships are a fast-paced environment. With everything else going on at your dealership, it can be hard to dedicate the time to maintaining and strengthening your online presence. That’s what we’re here for. 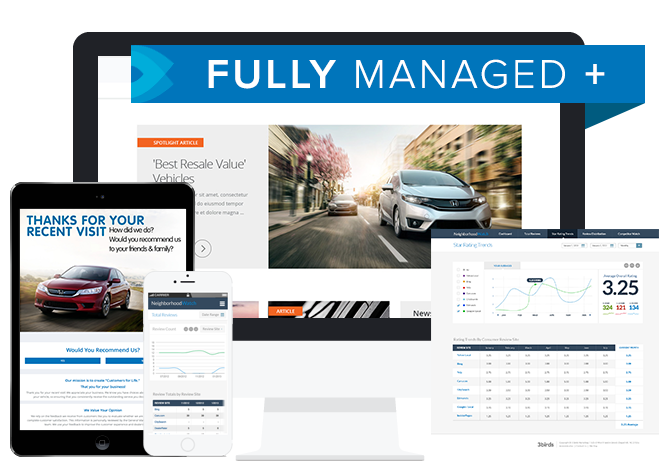 This package includes all of the features of the Honda / Acura Basic Package, plus dedicated account management, dealership-specific content, and organic review-building across all of the most important review sites. Incorrect info, negative reviews, and sloppy images are red flags for car-buyers during the research process and can hurt your SEO. We’ll claim and optimize major social and review sites to help you engage and attract customers at this critical stage. 88 percent of customers trust an online review as much as a personal recommendation. * That’s why we focus on all of the major review sites—not just one or two—to increase star ratings and positive reviews everywhere that your customers are searching. Dedicated Performance Managers craft responses to consumer reviews and address new concerns, keeping complaints offline and winning back previous defectors in the process. Take control of the online conversation like never before. 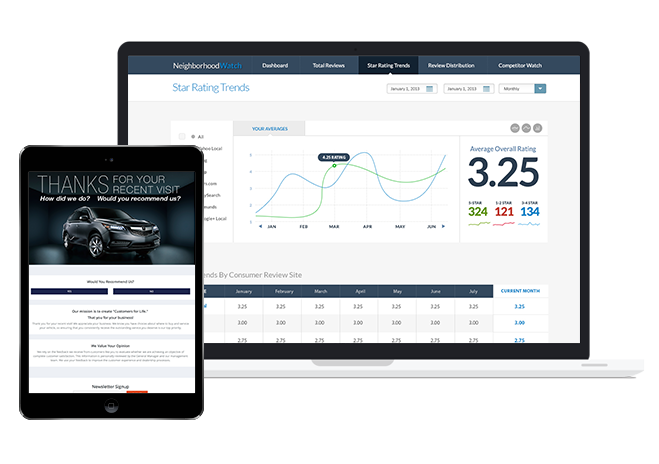 In addition to all the features of the Fully Managed package, our Premium offering includes a digital newsletter and engagement site specific to your dealership. Utilize this powerful tool to gain new customer insights, build the value of your database, and keep customers coming back. More customers are reading emails on mobile than ever before. Our email newsletters and hosted engagement websites are both built on fully responsive technology with a mobile-first design aesthetic. Increase your social engagement and audiences by sharing dedicated newsletter content across your social channels. We’ll help you extend the lifetime of your new content pieces and revive older pieces for added value. Every click tells a story. 3 Birds’ robust reporting dashboard includes customizable reporting and analytics so you can dig deeper into your customers’ behavior, interests, and demographics—and tailor your future marketing to capitalize on these opportunities. 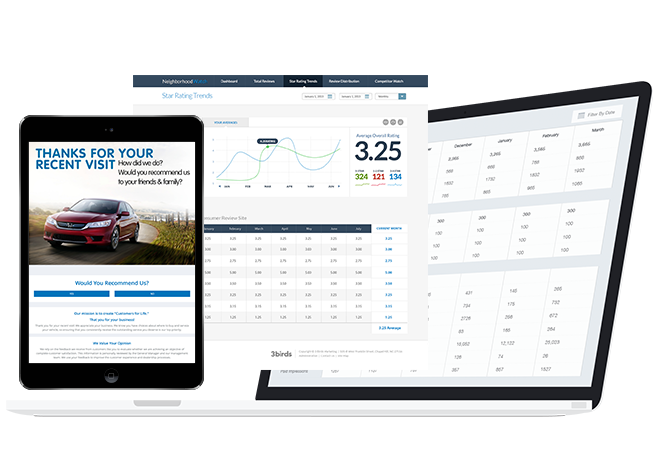 What your customers are saying online matters, but the growing number of consumer and automotive review sites can make management a nightmare for your dealership. Your dedicated Performance Manager will craft responses to consumer reviews and address new concerns, keeping complaints offline and winning back previous defectors in the process. Review-building streams from 3 Birds focus on the sites that matter most to your auto dealership, helping you gain new positive reviews while addressing customer complaints before they end up online. You can customize the packages above with these add-ons below to enhance your social media and reputation strategies. OCCASIONAL OR RECURRING. Social advertising can be added to any package or purchased as a stand-alone item. We charge a management fee of 25% of the social advertising spend for occasional social ads or 20% of the social advertising spend for ongoing social ads. We also require a minimum social advertising spend for ongoing social ads.